Who knew that picking out tuxes would take over two tiring visits, with one lasting over 3 hours? I fully trust Dear's opinion on menswear (he, after all, has had more experience in that department than me). And with something like a tux (minimal color selection, 3 basic shapes revolving around the number of buttons), I figured how hard can it be, especially since he had done some research and even gone to the store to get the process going? Well the salesperson strongly suggested that I come back with fiance since in her experience the bride may veto all decisions that the groom ever came up with. So I went to the Men's Wearhouse in Queens Sunday evening with fiance. It was crowded and we had to wait. What drives me mad about the concept of the store is that there isn't anything for you to try on. I had trouble picturing what would look nice on Dear (I have reservations about ivory on Asian skin, even though my dress has a bit of an ivory tinge but I want him to stand out from the GMs, who will "match" the BMs) but there was nothing there for him to try on. The best I could do was hold the swatch of the vest next to his face and even then I couldn't really tell. I also couldn't tell which style of tux looks best on Dear since he couldn't try anything on, so we just relied on the opinions of others, who said 2-button. I know customer service is their thing at Men's Wearhouse and they pride themselves on it but I thought it was a very assembly-line kind of service (as if they had been trained on certain points and they had set answers and scenarios to spit back at you) but what can you expect for something with limited choices and is quite simple? For example, they have a set of vest patterns for various colors. On top of that, few patterns are nice. The pattern I liked best (and what we ended up choosing) unfortunately has a lot of black stitching throughout, so it actually makes that vest look like a much darker red, which is much darker than the red of the BM's dresses (unless I switch dresses for them, which is likely). When I brought this up to the salesperson, he tried to fake it by saying it's OK b/c the underlying red is still the same (or pretty close) as the red of the dresses, even though I didn't bring a swatch at that time. The next day, when he saw the swatch, he realized I was right but he still insisted that it's very close, when it's clearly not. I didn't give much of a fight b/c I realize there's nothing he can do (and I really don't care enough to try to find exact matches elsewhere) and I'm OK with the different colors (plus I may have to change the dresses anyway). The ties are also very limited -- all are clip-ons, with no choice for anything else. The process is at least, somewhat streamlined. Once we picked out the type of tux for everyone who needs one, the salesperson punches in all the info that he had written down on our group's folder, gives us this looooooong receipt with all the info, and then measures whoever needs measuring. Then when the others go get measured, all they have to do is give our group number, get measured, and be on their way. Only we have the ability to change any of the specifications so even if someone hates our choices, they can't change it (when he said that, I thought how great that'd be for BM dresses but alas women wouldn't want to rent that, would they?). So the GMs will be wearing what I recall is the "Rio" vest and long Euro tie in burgundy (the pattern consists of textured vertical stripes created by stitching in different directions -- does that make any sense?!). Dear will wear the same thing but in ivory. In fact, everyone will wear ivory shirts so as not to look weird (or dirty) if it were next to white. The fathers will wear the same pattern vest with bowtie in gray. My brother will wear the burgundy ensemble but a bowtie to bridge the difference between the fathers & GM (but I never asked if he'd be OK w/ that b/c I have a feeling he wouldn't want to wear a bowtie). 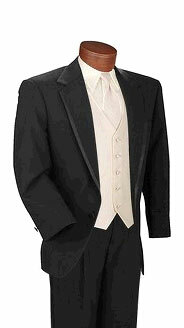 As for tuxes, the only interesting thing is Dear's tux, which will have an edged lapel (instead of a full satin lapel) which I think looks very smart. And supposedly this was the "hot look" during the Emmys. Another thing I wasn't crazy about MW is the seemingly sleazy salesppl (most of them, anyway). The guy who eventually set up everything for us was pretty nice, and I think he worked as well as he could to satisfy us with what he has, but his manager, who first sat with us reminded me of a car salesman. I think he didn't really want to work with us either b/c as soon as his peon was free, he pushed us off on him so that he could go off and twiddle his thumbs. We were also accosted by this guy who wore awful cologne when we first walked in and he was so eager to sell Dear a suit. When the tux salesperson walked us over to show us the shoes (Dear has issues wearing rented shoes, and I don't blame him), the awful cologne guy immediately rushed over, eager to sell his suits. I think that happened at least twice. At the MW Chelsea location on 20th street, I believe you're actually able to try on the various jacket styles, shirts, vests, etc. The vest selection is limited, but I actually think MW offers a decent selection of jacket styles, even if there is an over emphasis on today's fashion trends on this classic outfit. Its insistence on offering only clip-on ties is an abomination. Sadly, in today's dress-down/business casual world, it's tough to find a haberdashery that knows and sells classic formalwear with all the proper accouterments. Agreed-- if you want to try on styles, it's better to go for something like http://www.gatheringguide.com/ec/bridal_shops_dresses.html and find a place there. We went through this same thing with my best man last month. I hate shopping!! (But we did come away with a cute one).